It is time to take The Mango Hunters off the Loom. I am too excited to offer much commentary so I will let the pictures do most of the work. There is no time for a party right now, saving that till Spring because there is so much to do. 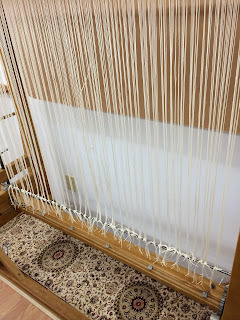 First, I'm going to release the warps from the warping bar because one side only has about 5 inches of warp and I don't want to cut it too close. 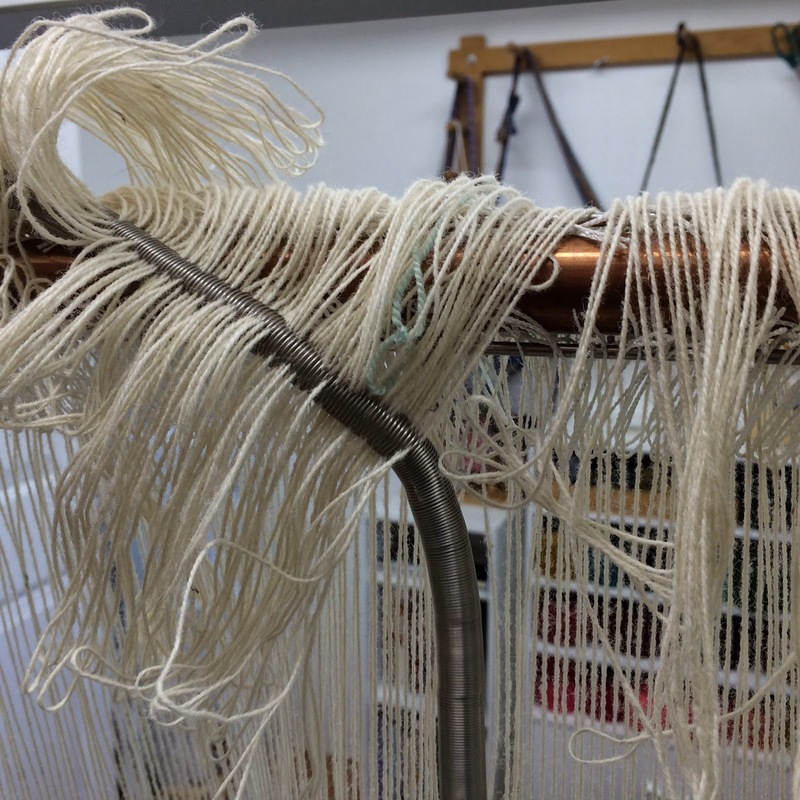 and finally cutting the warp on the generous side. 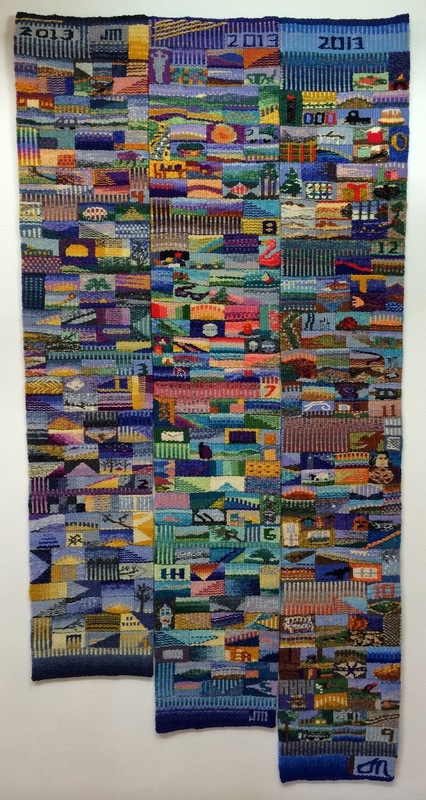 It looks just like a tapestry! Now to retrieve those precious heddles. 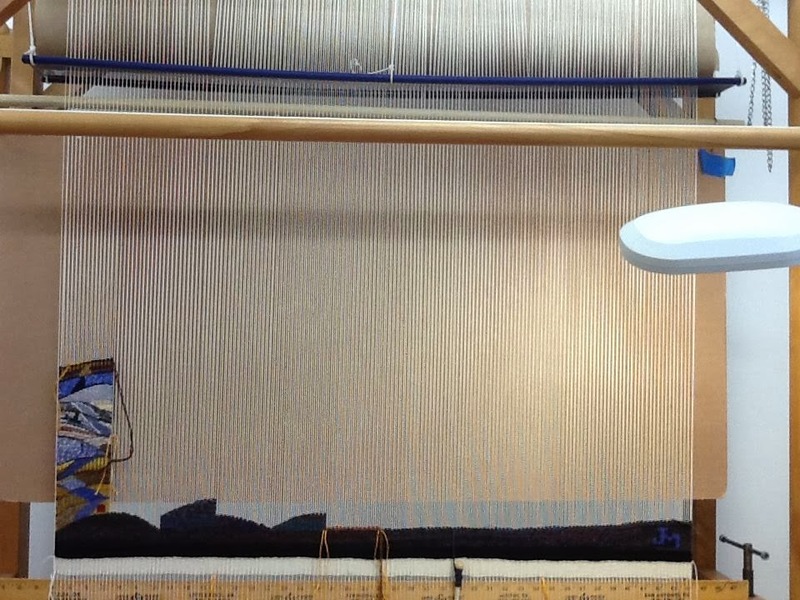 Taking a better look and doing some measuring, about 29" by 40" off the loom. Now for the finishing. I'll be busy for a while. Decided to share about two good books today, one old and another one new. I first discovered The Art Spirit by Robert Henri when in college ( it was the seventies) and read it through not knowing at the time that I would continue to find inspiration there for the next 45 years. It was first published in 1923 and I have two well worn copies, the second purchased when the first could not be found for some reason. Recently, I discovered that the 85th anniversary version is available on Kindle. Somehow the idea of being able to carry it with me wherever I go seemed brilliant and so now I have three copies. If you are not familiar with the book, Robert Henri was renown in his lifetime for being an inspired and articulate art teacher and the book is a compilation of his teachings. When I require comfort food for the artist's soul I reach for The Art Spirit. Yes, the language is a bit dated and the constant referral to the artist in the masculine form is something the modern sensibility will take notice of. I think what draws me to the book again and again is that the love in its pages is palpable, love of art, of teaching and of students. A quote or two, " When the artist is alive in any person, whatever his kind of work may be, he becomes an inventive, searching, daring, self-expressing creature. ... He does not have to be a painter or a sculptor to be an artist. He can work in any medium. He simply has to find the gain in the work itself, not outside it." My personal favorite, "There are moments in our lives, there are moments in a day, when we seem to see beyond the usual. Such are the moments of our greatest happiness. Such are the moments of our greatest wisdom. If one could but recall his vision by some sort of sign. It was in this hope that the arts were invented." So if you find yourself in need of some nurturing and some practical advice that stands the test of time try The Art Spirit by Robert Henri. My art spirit is beginning to blossom in my new space. It took a couple of days to get comfy but now I am working happily. 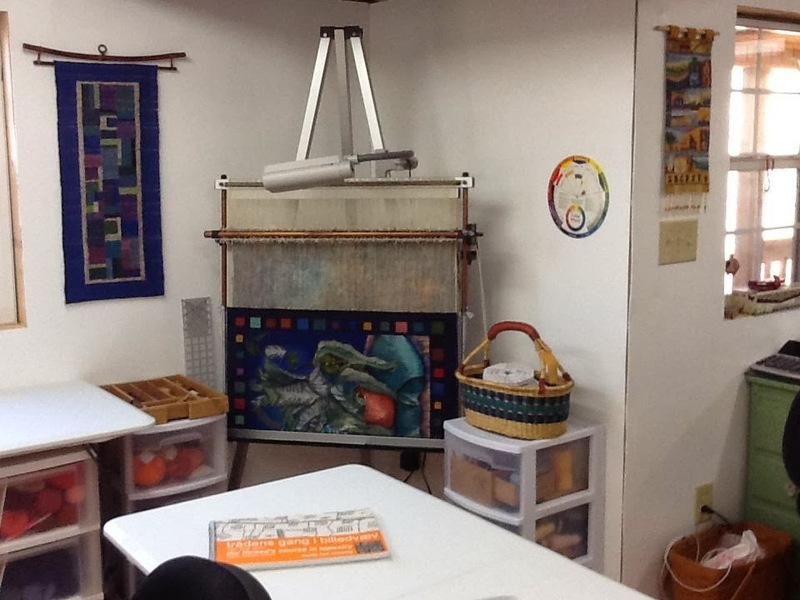 Notice the new table and chairs, the warp board is hung and the 2014 tapestry Diary is underway. I've also been working on finishing 2013! 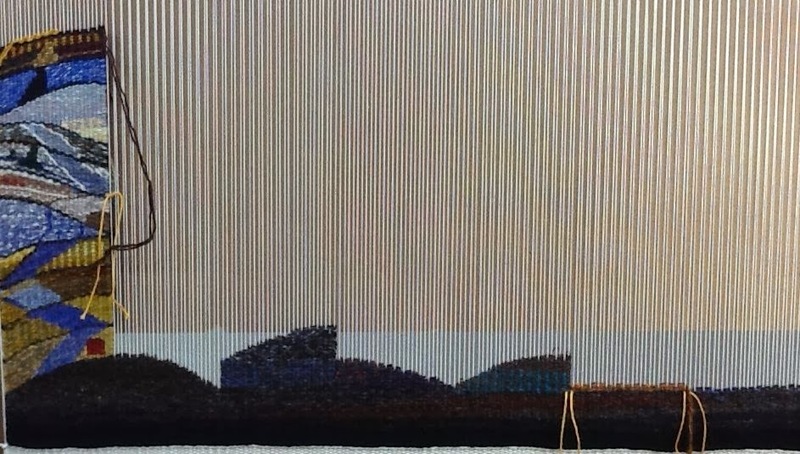 The mowing and slit sewing is done on panels one and two and now the third one is coming along. The year in three parts, 2013 the triptych. I think I will finish them in three separate pieces but hang them together as one. 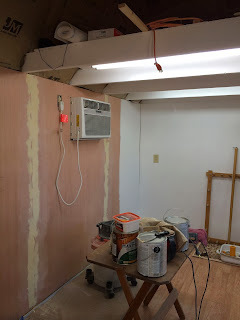 The studio now has hot and cold running water, in the form of a cooler and notice that the brown insulation is no longer visible between the beams. I've finished the bottom base for the 2014 Tapestry Diary and coming along with the month of January. Here is a detail of the month to date, which brings me to the other book I want to share. I know that I have mentioned The Threads Course in Tapestry by Mette Lise Rossing before but now that I have actually started to study it I find a new respect for this work. 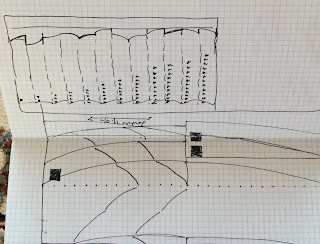 I have been using some of the technical drawings to experiment with in the 2014 TD. I started on the Twill with ground weave drawing, variation 14 on page 13 and at the top of this detail is my first experiment with it. I really like this technique and kept thinking about the possibilities for using it. At the top of this photo is another experiment with the technique. Here I was wondering how it would look combined with Pick and Pick. I thought it looked great! It really is my intention to try several of the variations from the book in my TD this year and sprinkle them in every now and then. I have decided to note the dates I try them in my book next to the drawing for each technique. It may take a while to move on though because right now I am having so much fun with this one. I keep thinking of ways I could use this in a tapestry. I am happy to be finding joy in the work itself and wishing the same for all. We have been working for the last three days on getting the Fiber Studio put together. Mack brings in the fixtures and I fill them. 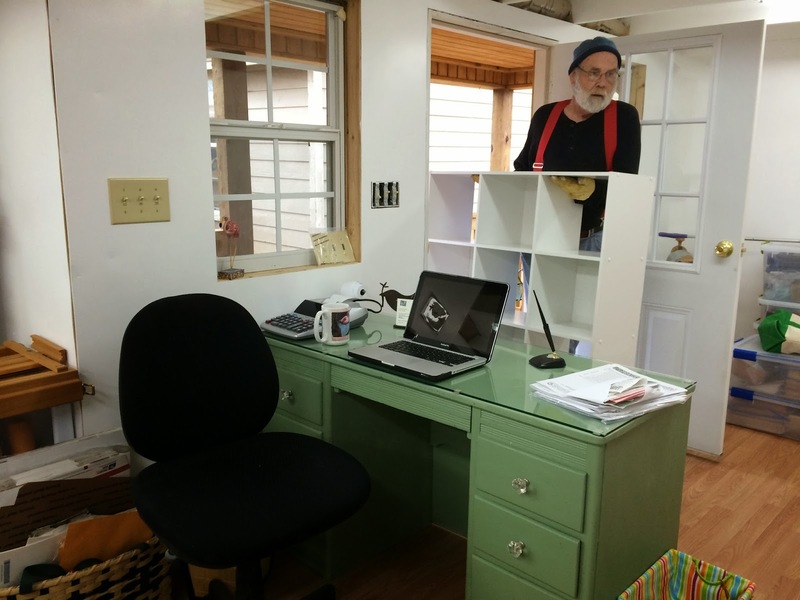 Even though we are still lacking some trim work and finishing I decided that I needed to get my work area organized. We will keep working on the rest and eventually it will get finished. Here is a little tour of what we have so far. This is what you see when you walk through the door. The Ymmyarns have a new home! This will make it so much easier to reorder. It is rigorous duty being a keeper of yarns but somebody has to do it. 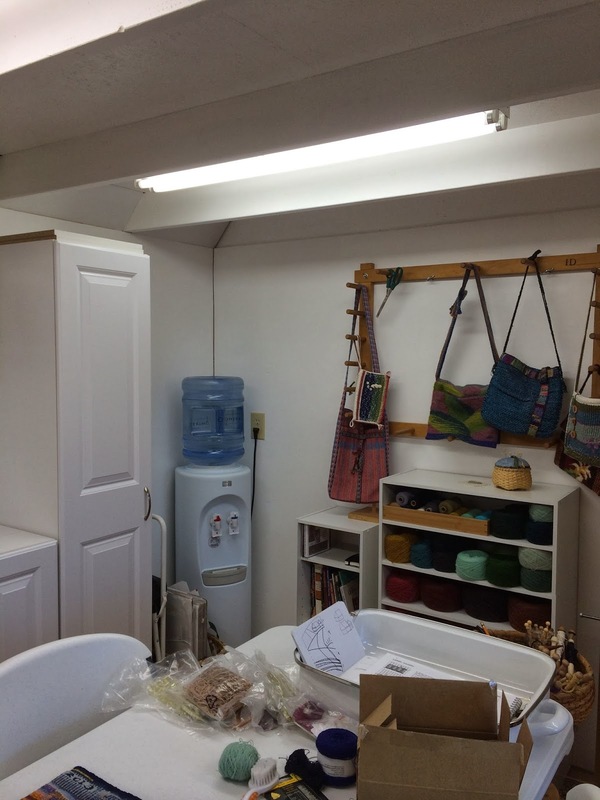 I have thought about three goals with this space, and though compact it is working out the way I planned. 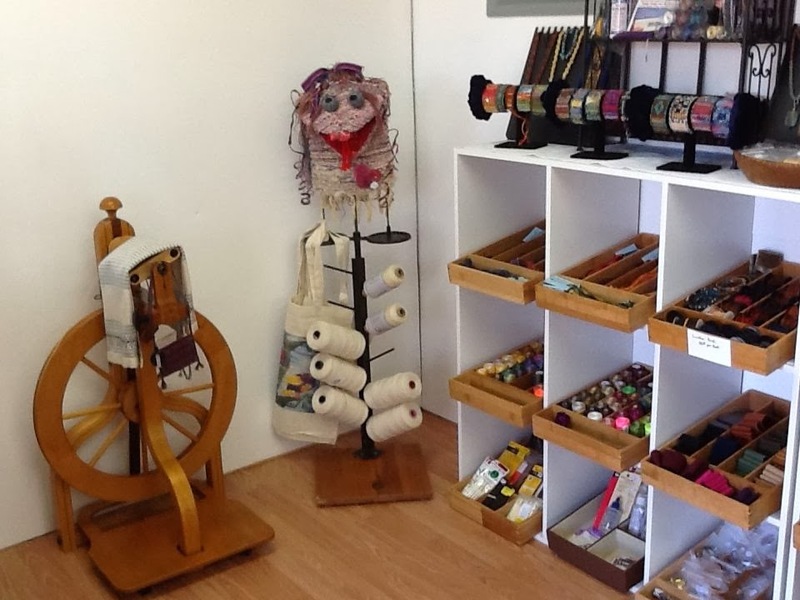 A place to display the shop items, a place to work and a place for friendly visits and classes. 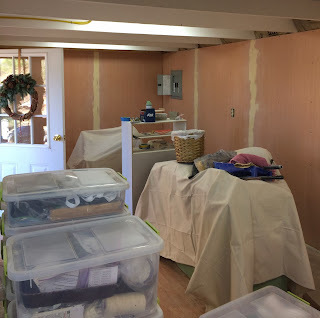 I do still have two rooms in the house for the floor looms, sewing , pressing, and drafting table. I would love to empty one of them but I will have to work on that. This is looking down one side of the room from the front door. I am still waiting on the water cooler to be delivered and it will go in the far corner. 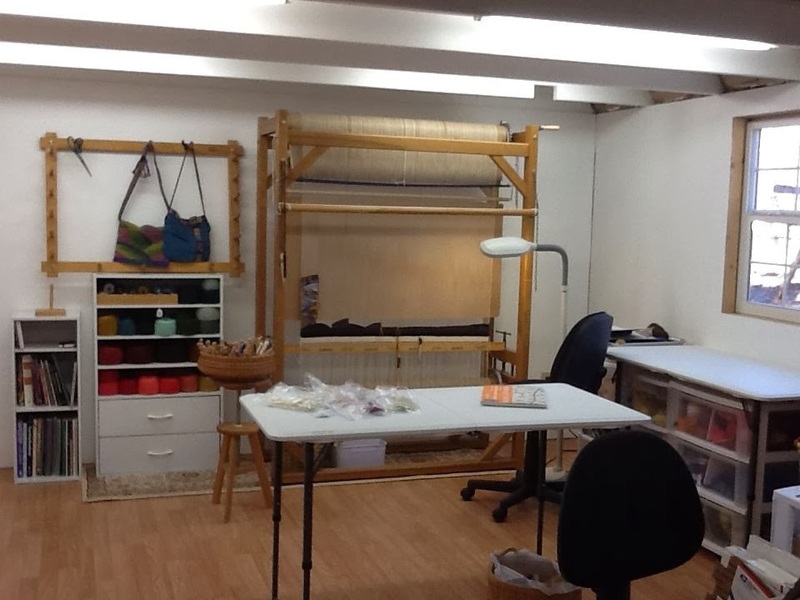 On the back wall is the Gobelin loom with the new Tapestry Diary for 2014. 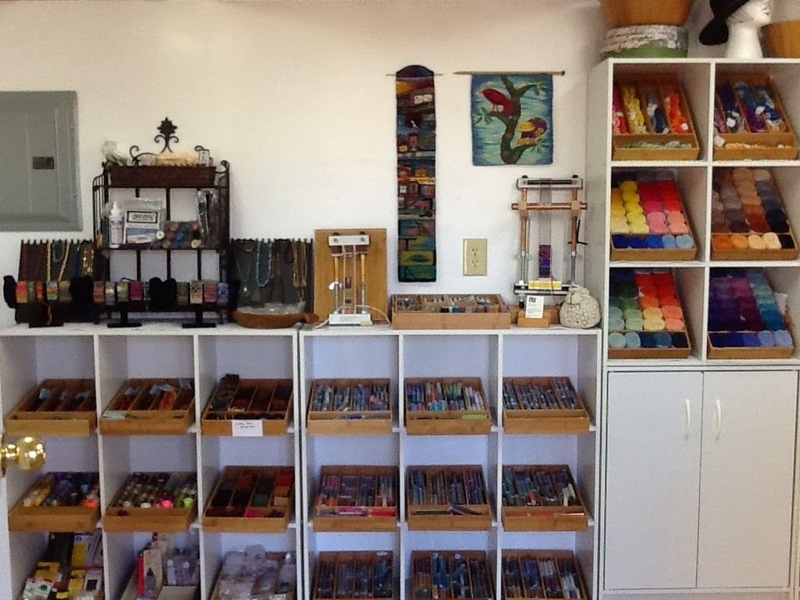 It is the only weaving I have been able to squeeze in with all the setting up we have been doing. I have really been enjoying working in this space. 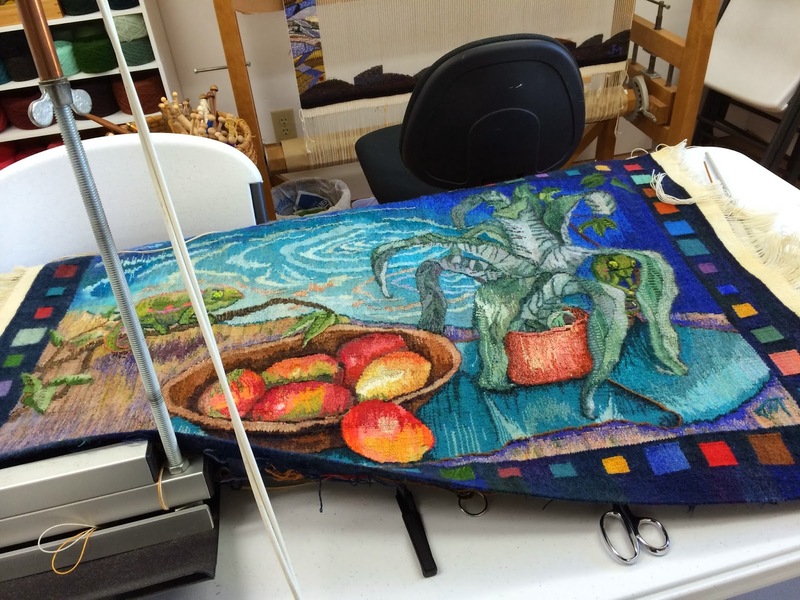 My Mirrix Joni loom has a space in the corner where the easel fits nicely. I haven't gone shopping for my larger table and chairs but that is next on the list. Here is a view of the front door. 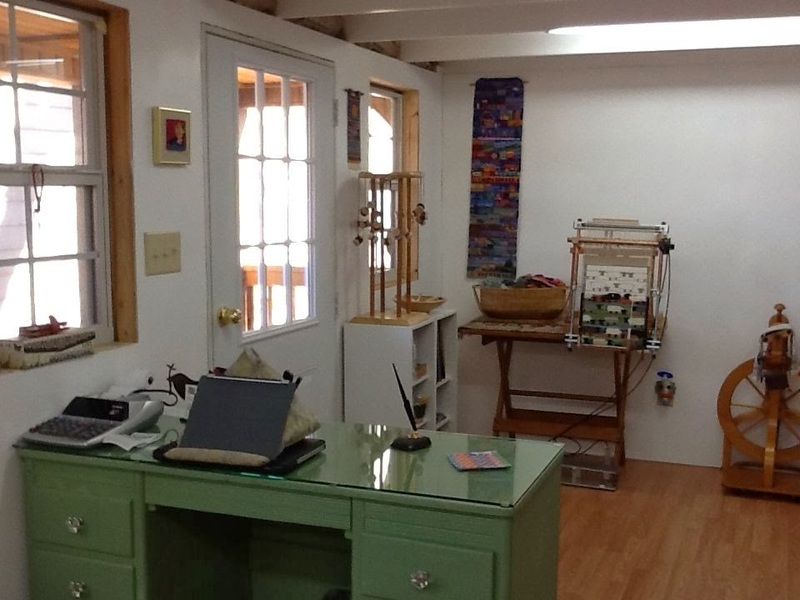 I have the Sheep Sampler tapestry on a 16 inch Mirrix there. 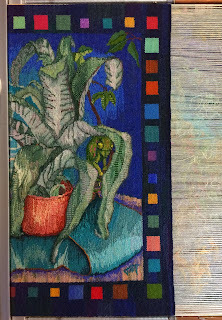 I usually work on it when I do shows but I am working towards completing it and having a new demonstration tapestry for the Spring/Summer shows coming up. 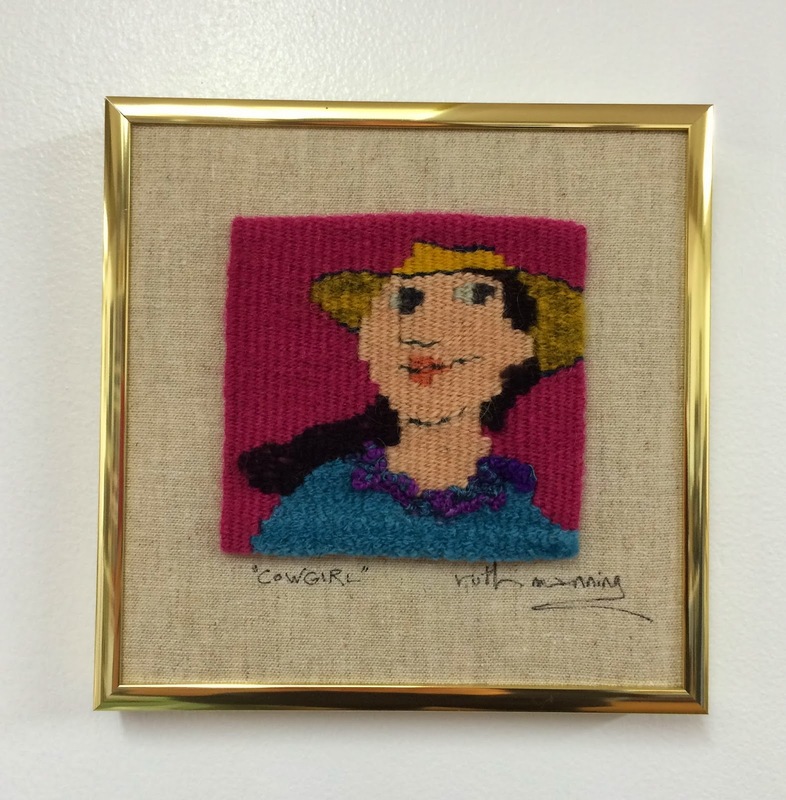 The small tapestry on the wall is one by Ruth Manning titled "Cowgirl" and I knew she would fit right in when I saw her. I have put a link to Ruth's website and blog on the right under links. 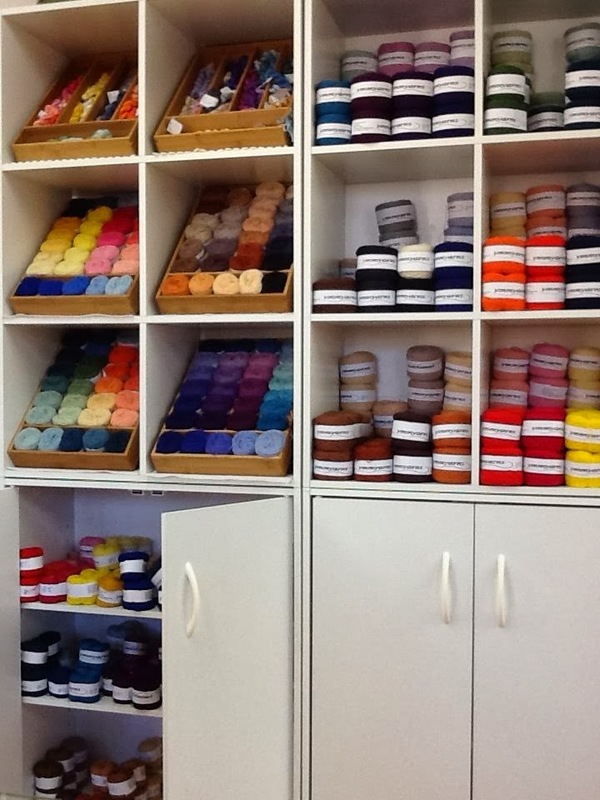 and the area that is beside the yarns. 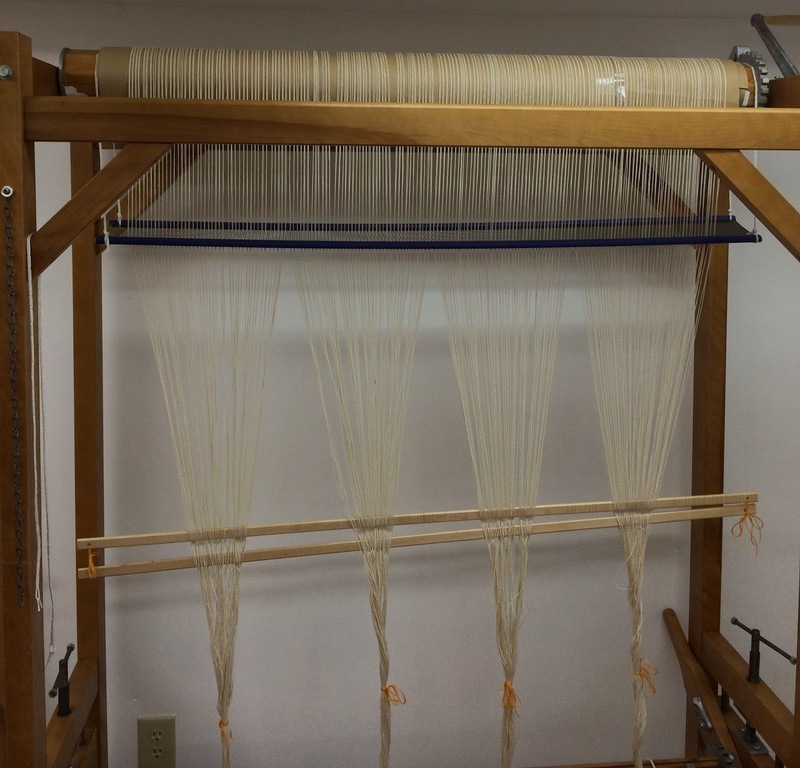 For the 2014 TD I decided to warp the Gobelin about 40.5 inches wide and 8 epi, then I wove a base for the entire width and the months will be woven as columns 27 warps wide with a final border across the entire width at the top. It took a while to get going on the daily bits because of the size. 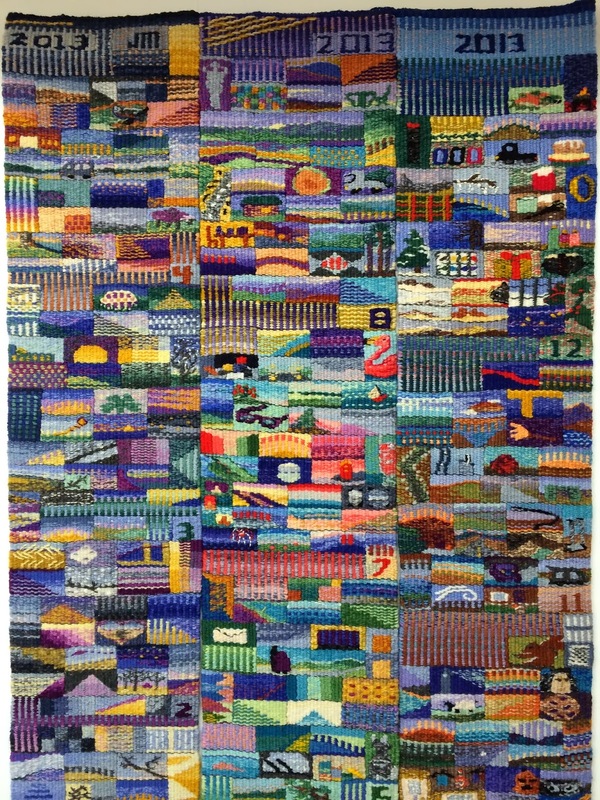 This will be the widest tapestry I have undertaken but now that it is started the daily parts should be easily woven in under an hour. and a better view of January so far. I still have today to finish. I have decided that starting a new TD is a like starting a new sketchbook and can be a little uncomfortable at first but I am beginning to warm up to it. 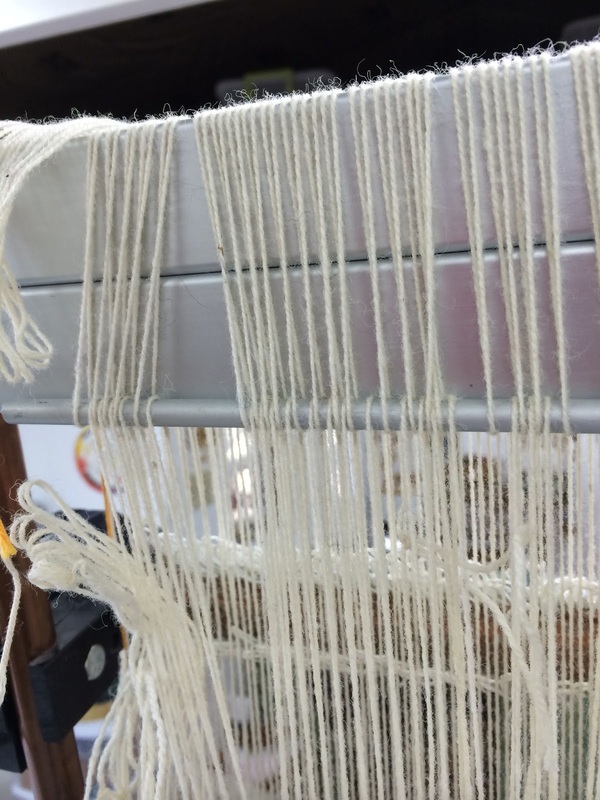 The daily weavings will be different heights this year although the width will remain constant. I started out with the idea of a woven path through the months but I am taking a lot of liberty with that plan! 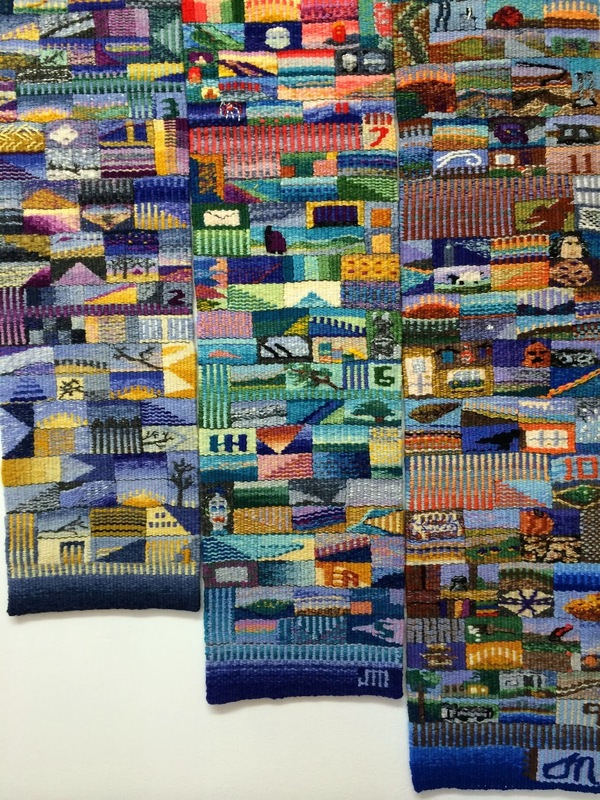 Recently a copy of The Threads Course in Tapestry has come in the mail. What a wonderful book! 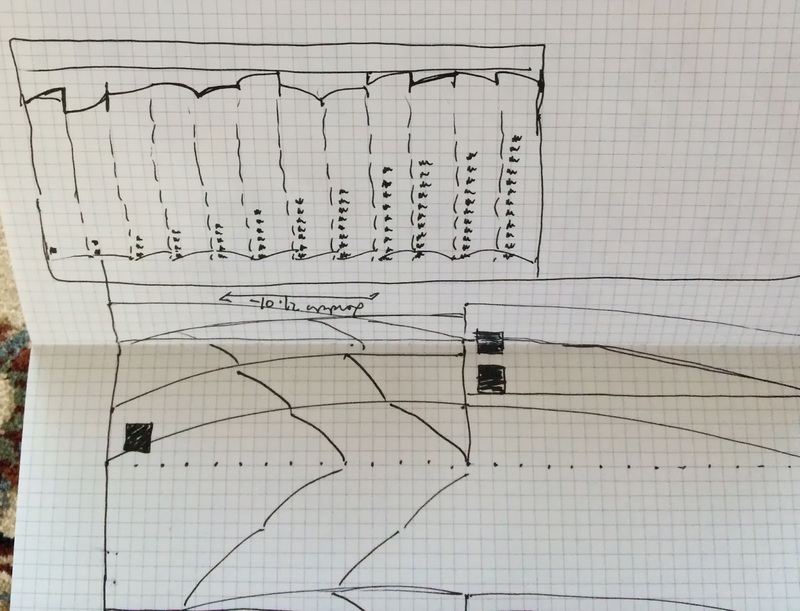 I really like the way the technical drawings are shown from both directions. I brought it out to the studio today thinking I might incorporate some of the interesting variations into the TD this year. Rebecca Mezoff has a wonderful video review of the book on her blog and Tommye Scanlin has mentioned it on hers as well. Hopefully I will be settling into a regular routine of work soon and carry on the finishing of the 2013 TD and the Mango Hunters. I have just put the finishing touches on a piece to send for the ATA unjuried small works show in Rhode Island this July. 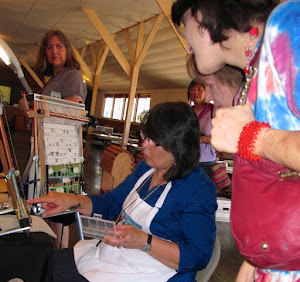 Even better, I am planning on attending the retreat myself and taking a workshop with Susan Martin Maffei! There are so many exciting things happening in the studio right now that it is hard to know where to begin. 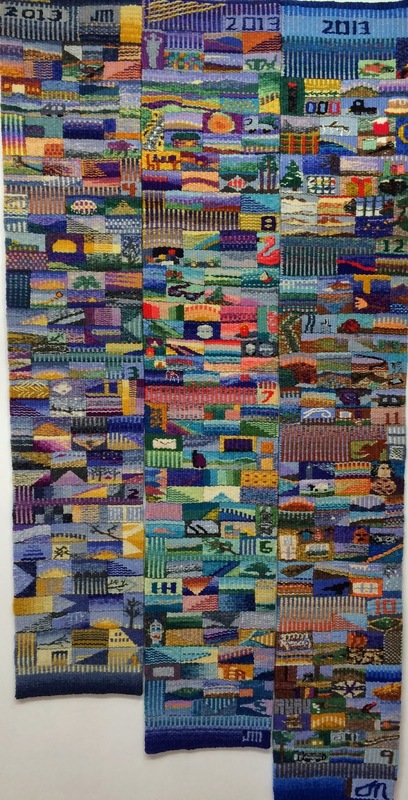 The Mango Hunters is woven! 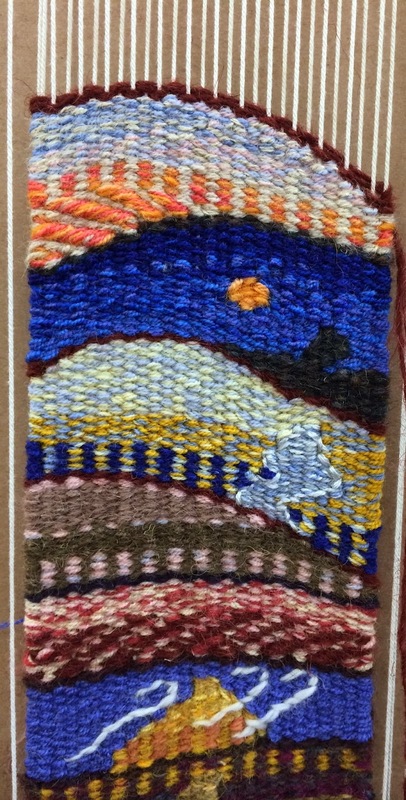 I haven't had time to let it sink in but I finished the weaving the day after Christmas. 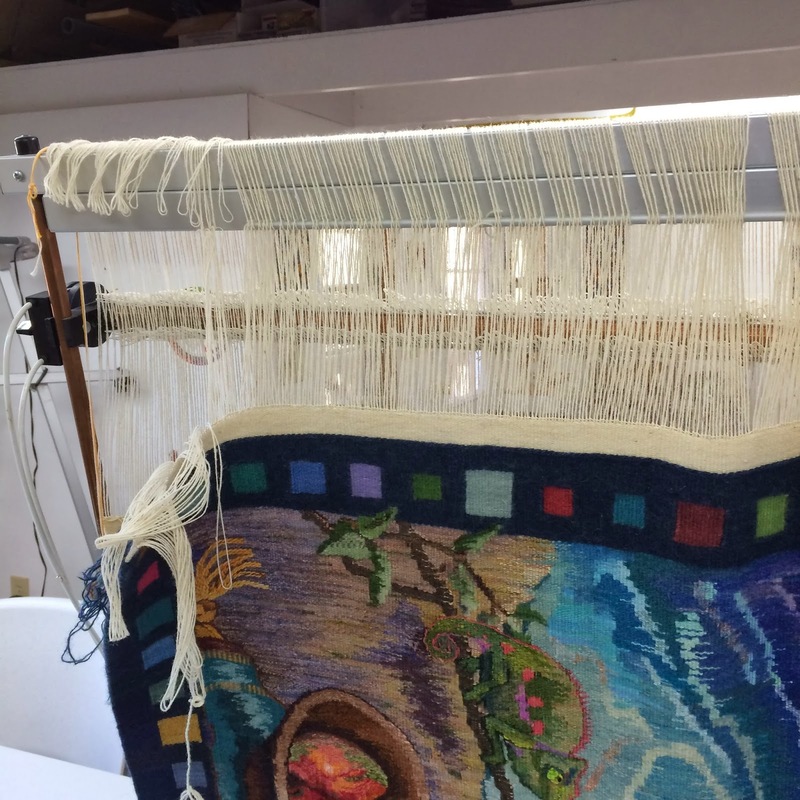 I still have to finish with a hem so it remains on the loom. 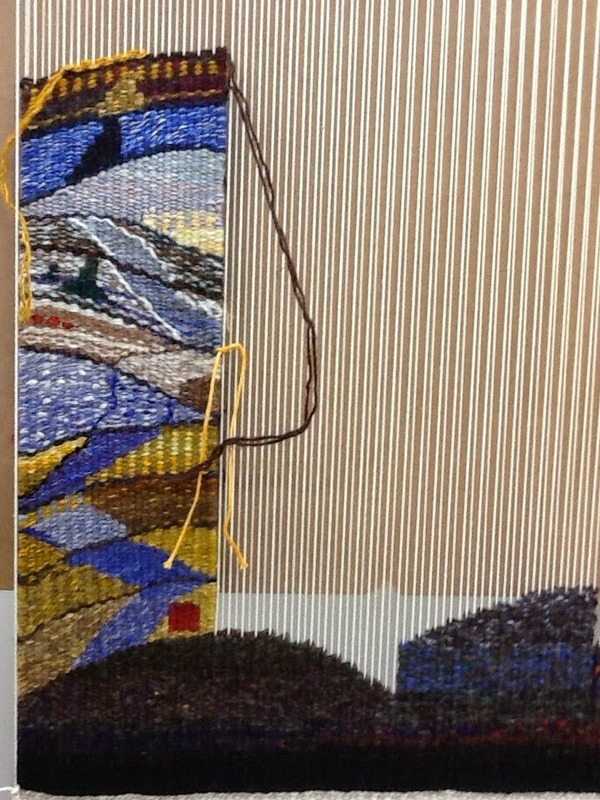 The end of the year is time for the Tapestry Diary project to take over. 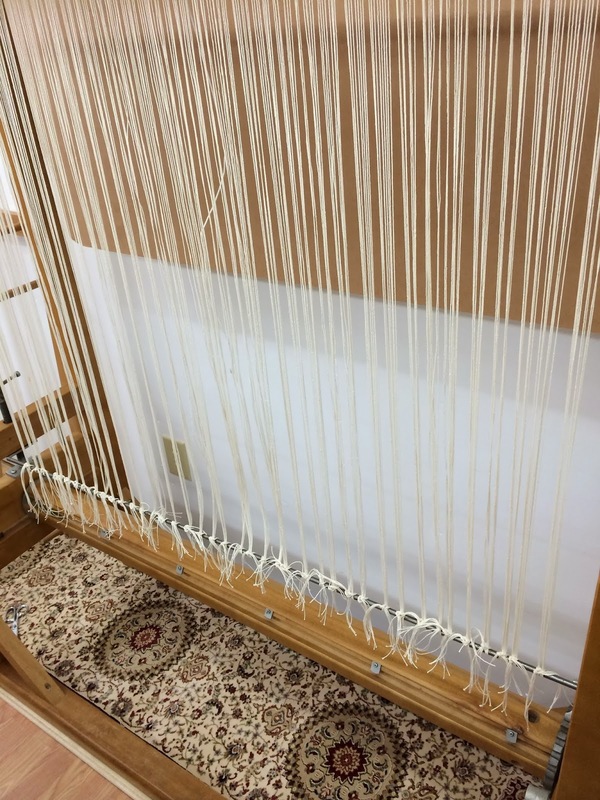 I should be able to follow up soon with a full picture and some finishing information but this is a photo of my current view on the loom. 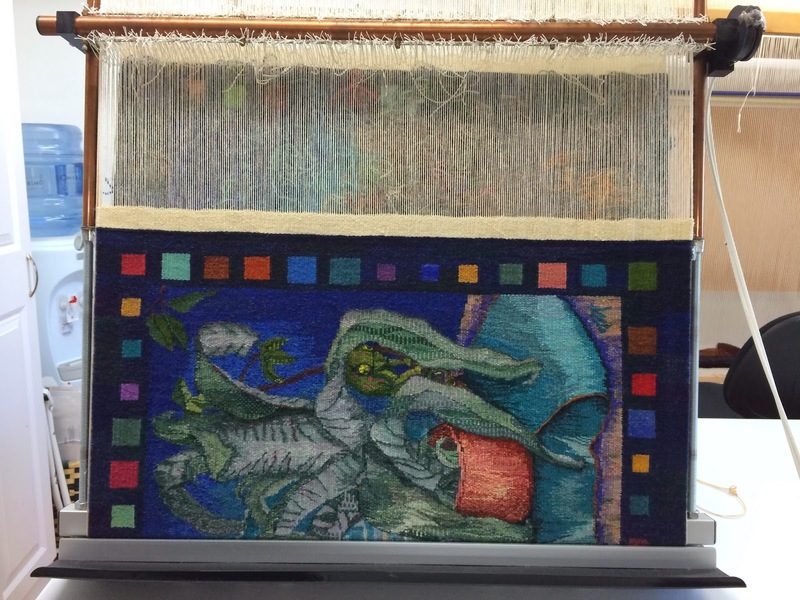 It will be hugely exciting for me to see the whole tapestry all at once and I am satisfied that my goal of weaving it by the end of the year is met. 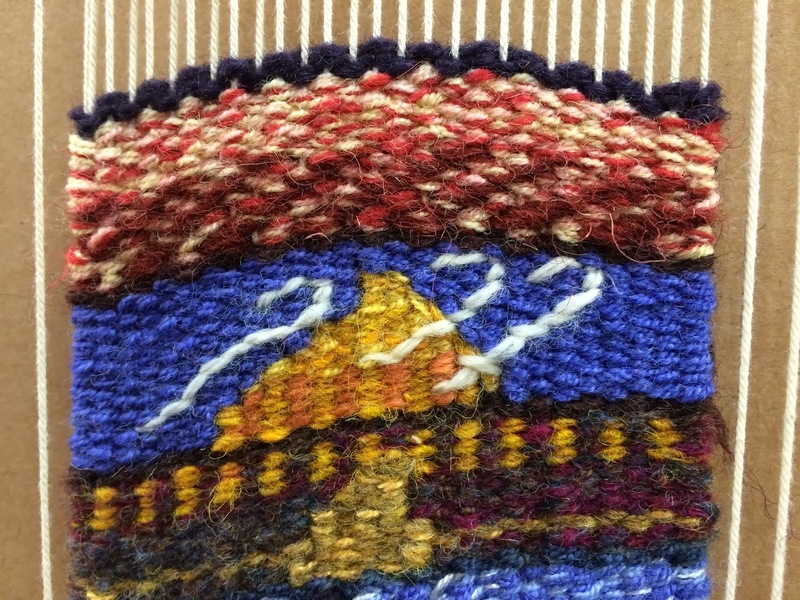 The 2013 tapestry diary was also finished on the 31st. here is a view of the last month of the year. There were many memorable moments and weather to record last month. I did a succession of three little landscapes looking out my back window, the day before the snow, the day it snowed and the day after, that were fun to do. 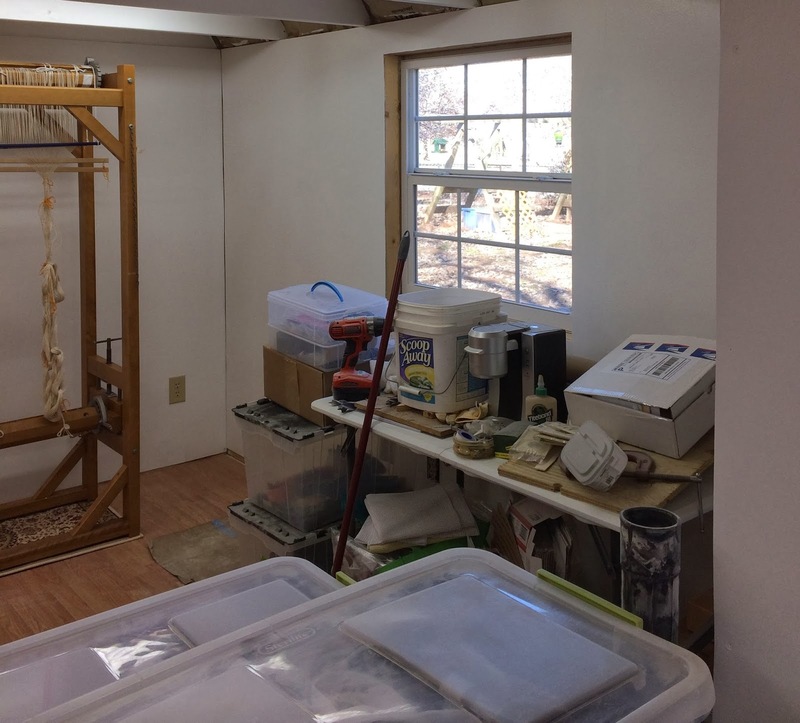 There are a few night weaving days, references to the ice storm and the new Hobbit movie, the animal that Purrlie the cat gifted to us, freshly baked raisin cinnamon bread and on and on. 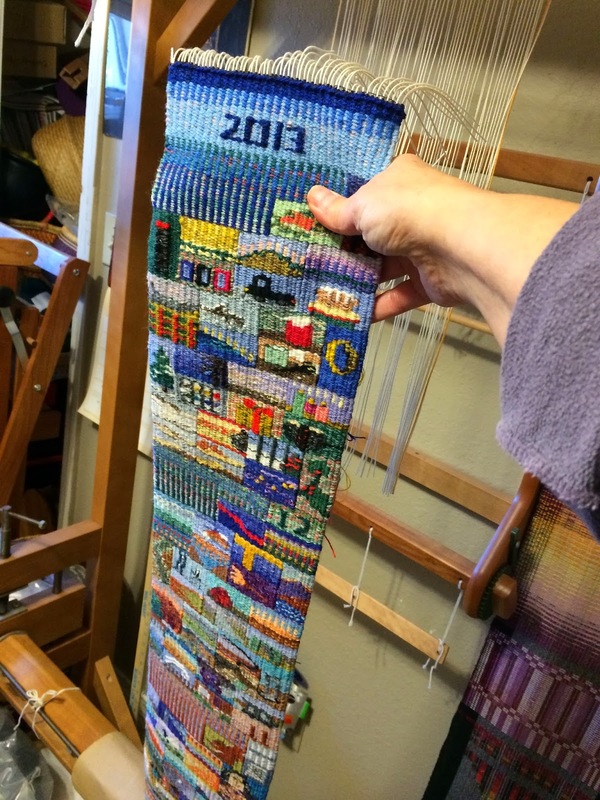 Here is a picture of 2013 coming off the loom. 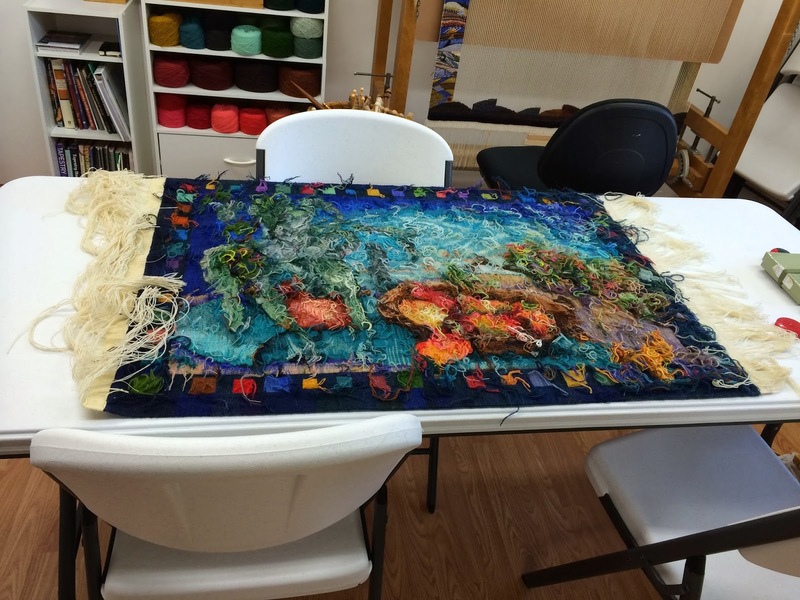 It was woven in three panels this year. 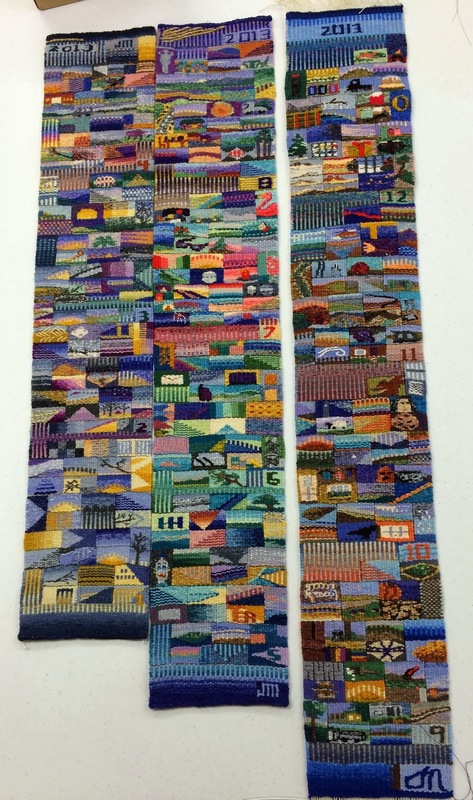 All of the are about 6.75 inches wide and sett at eight threads per inch. I haven't had much time to study them yet but here they are laid out on the drafting table. It is interesting that each new panel is about 3.5 inched longer than the next. The first, January through April is about 34.5 inches long, May through August is about 38 inches long and September through December is 41.5 inches long. I think this is mainly due to my expanding the pick and pick that lies between the months. I am still thinking that I may try to stitch them together but haven't made any decisions yet. 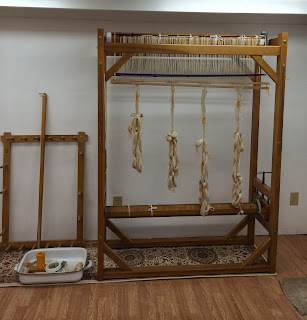 This picture was very hastily made and I will have some better ones later but there was no time to waste because I had to warp the Gobelin loom for 2014 and that was an adventure! 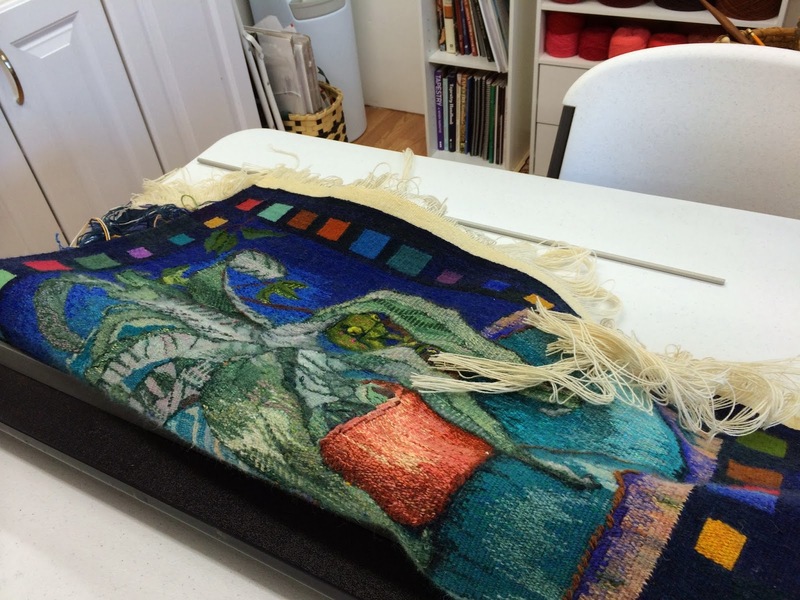 The whole process of getting ready for the new Tapestry Diary is becoming part of my New Years celebration. 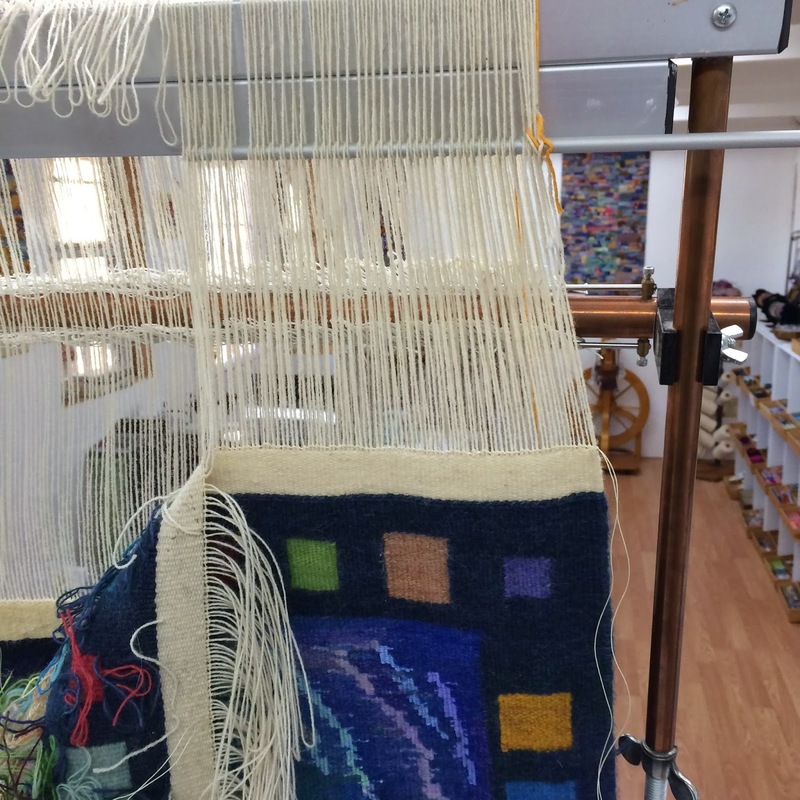 My idea for the 2014 Tapestry Diary was to warp the loom about 40 inches wide and start with a border that goes across the loom and then weave the months side by side as columns. 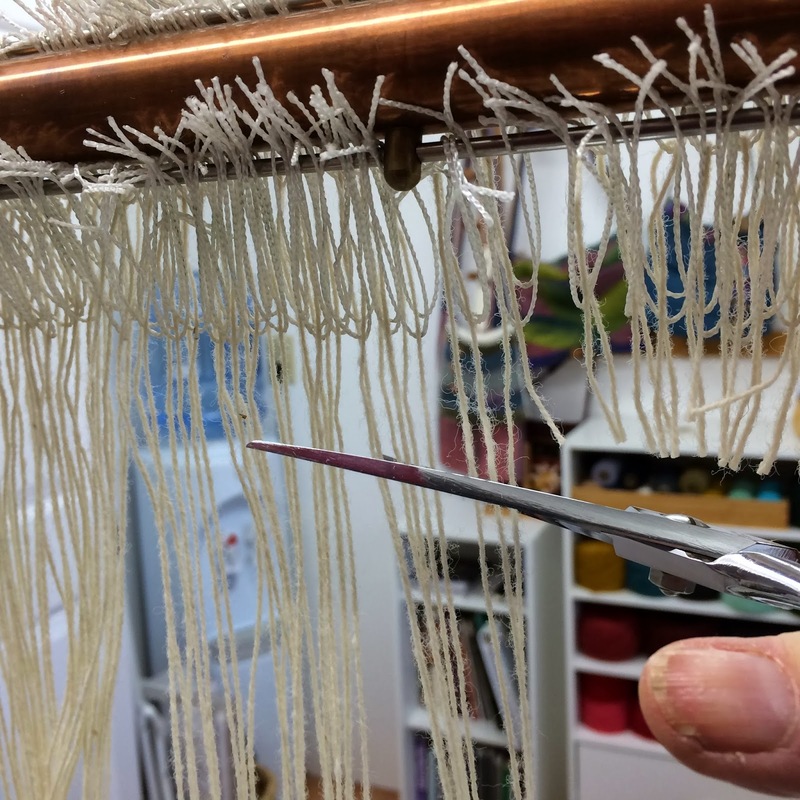 I will probably use a stitch as you go technique to connect the columns month by month. Here is a rough sketch. I want the months to be woven as paths and I am not sure yet how much that will change from month to month. The months will be indicated by a number of squares going up the side of the columns but I may change the side they are on from the sketch. I think working with the idea of a path woven through the month should be interesting and offer many visual possibilities. 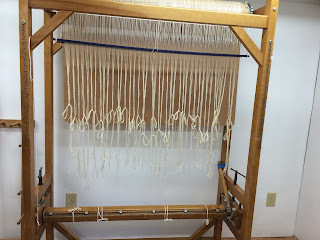 Warping the loom was the biggest challenge because I had to have the top beam off to move it into the new studio and the 2013 TD off the loom before I could do that. It helped that I had made the warp bouts ahead of time and sleyed them through the reed. 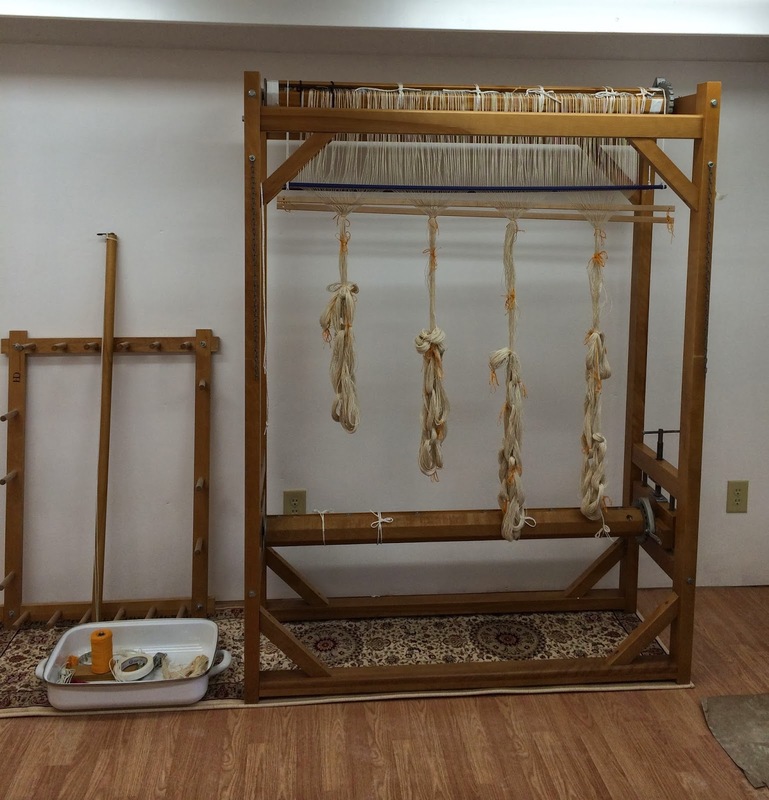 Yesterday we moved the loom into the studio and placed the top bar in with the warp ready to go. 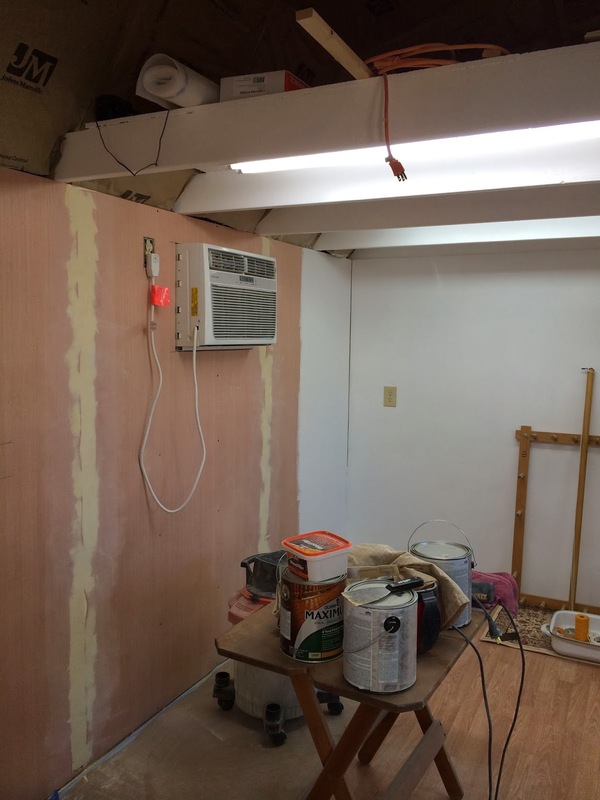 There is still painting and finishing to be done so the new studio didn't make the end of the year deadline. On the bright side it is coming along and we made a spot for the Gobelin so that I wouldn't have to wait till next year to move it to the studio. 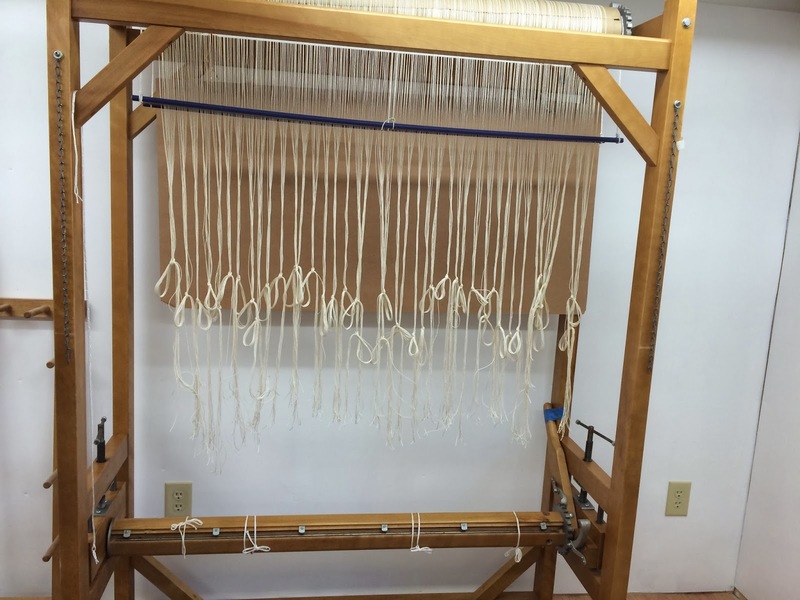 My next challenge is preparing for a weaving guild program on Saturday. 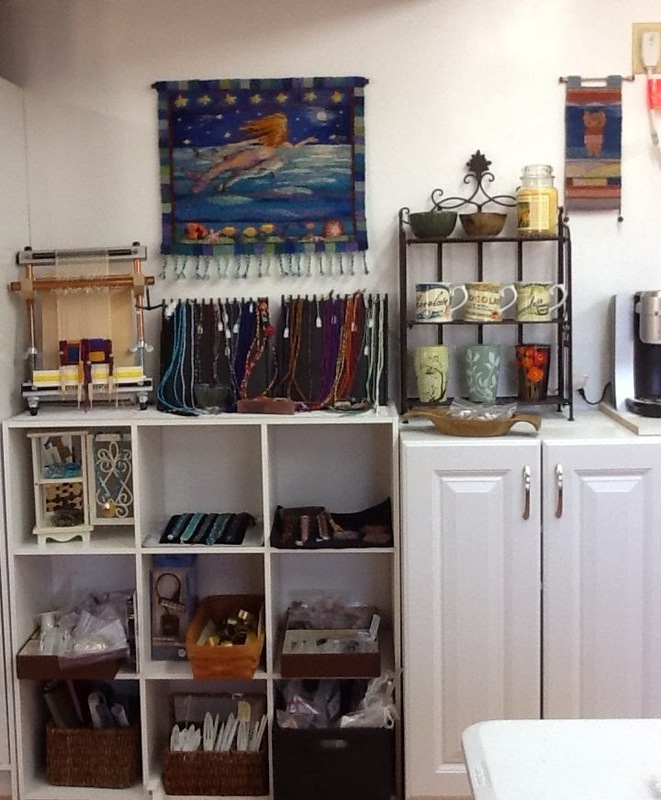 Finding the things I need should prove interesting with the present state of chaos that is my studio! and tied to the bottom beam. 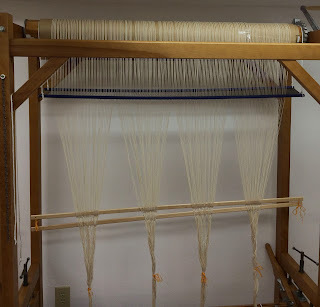 I have put a five yard warp on so I should be good now for a few projects. 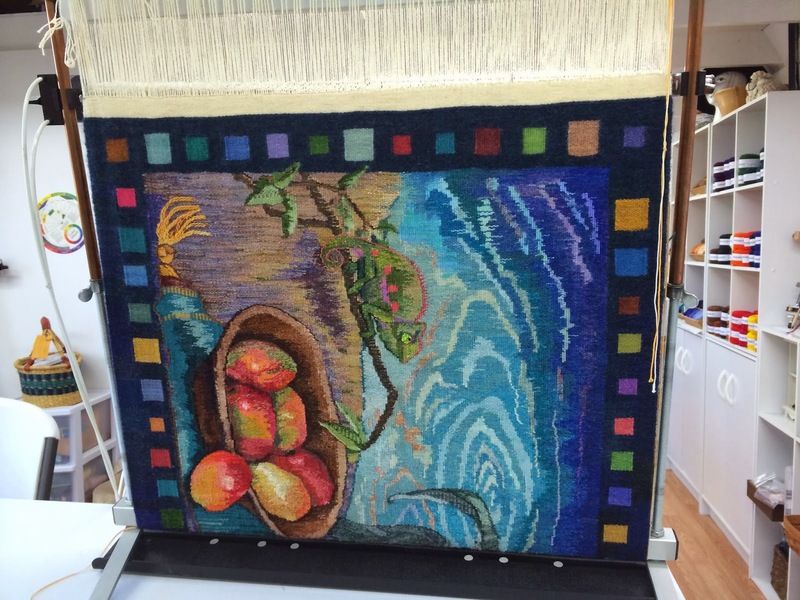 This is a little over 40 inches wide with 8 threads per inch. Last night I did some twining as the New Year ushered in but I still have a way to go before I am ready to weave the diary. 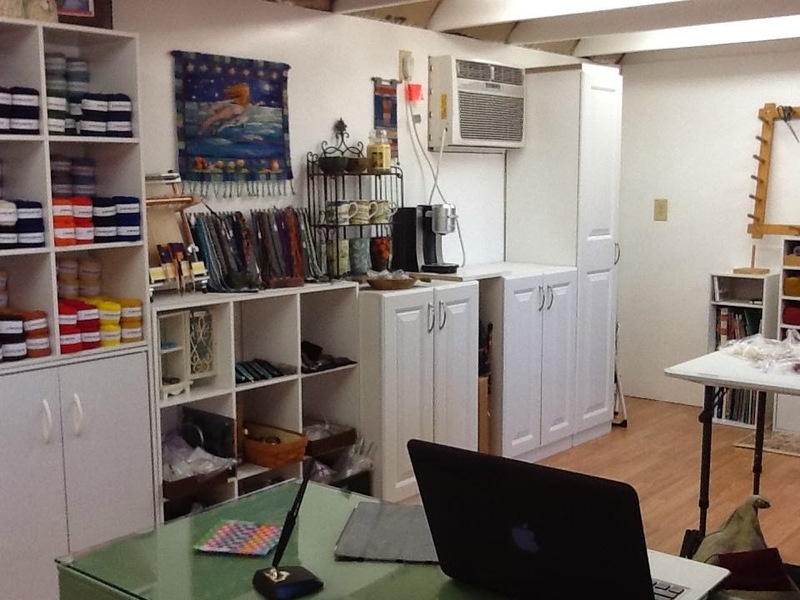 I really enjoyed working in the new studio. 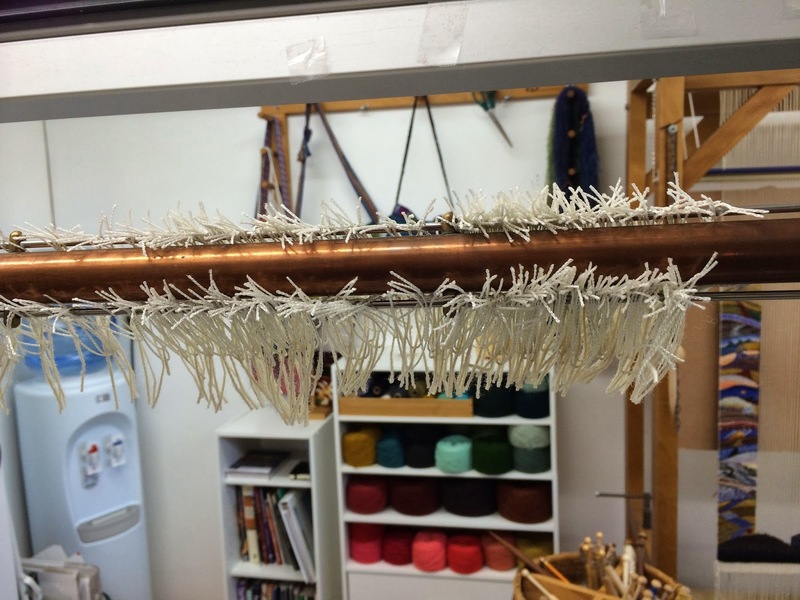 The light is great and the process of warping can be a very good way to slow down when your mind is racing with ideas and to do lists. 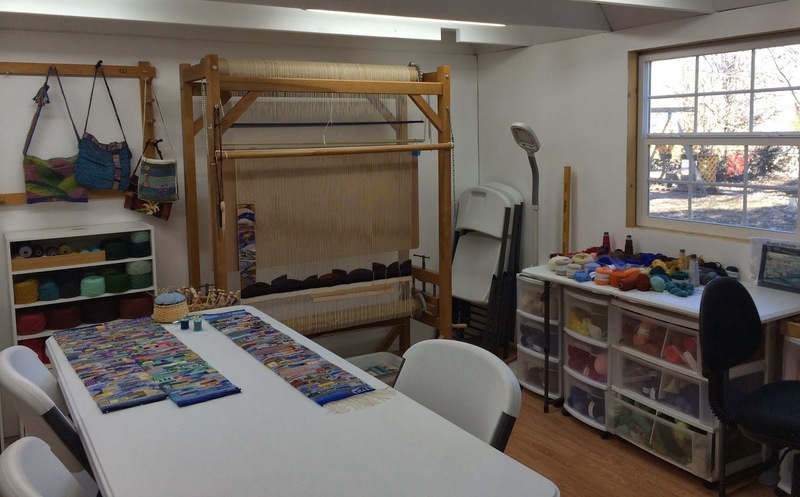 Hopefully some weaving will take place today. I have much to be grateful for and excited about in the New Year. 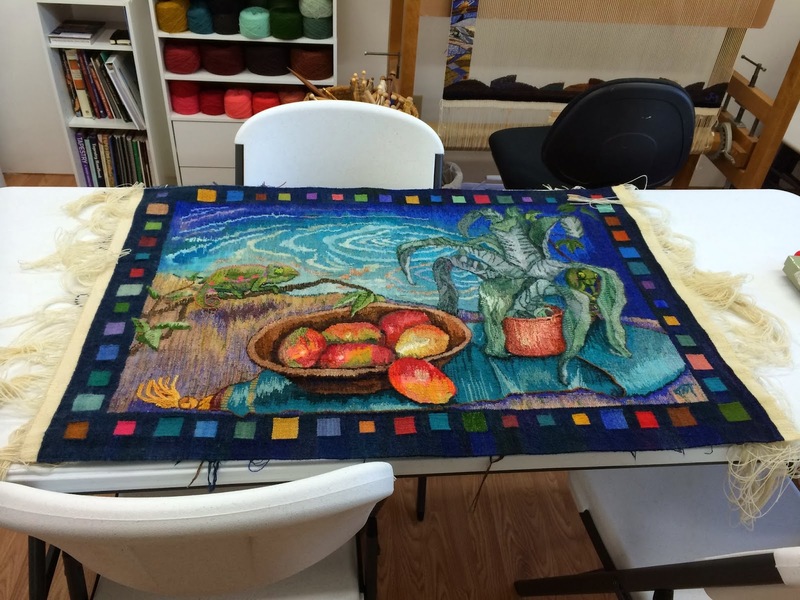 New projects, new studio (almost), finishing Mango Hunters, the 2013 TD and the Sheep Sampler and a new 2014 Tapestry Diary! I can't wait to get started! Happy New Year to everyone and best wishes for your projects old and new.